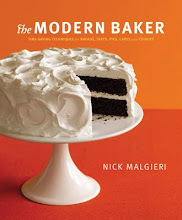 A small group of us have been working our way through Nick Malgieri’s Bake! at the slow steady pace of a few recipes per month. We took August off to catch up on any recipes we might have missed, or to get ahead on the next section. We started up again in September with Truffle Brownies, a great way to start, if you ask me. This was the second recipe for September, chosen for us by Kayte. Yes, I said September. I actually made this recipe on time, I just didn’t get around to posting it until now. A month to catch up, and I’m already behind. This was a fairly straightforward recipe. It’s basically an apple pie baked in a tart shell with a lattice crust. 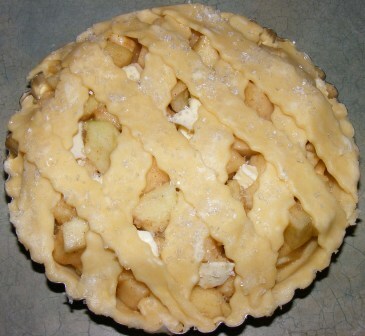 The lattice topping is brushed with egg wash and sprinkled with sugar. I had some filling leftover, so I baked it in a gratin dish with the extra crust from the lattice. This was a good pie, nothing extraordinary. Probably not one I’ll make again. 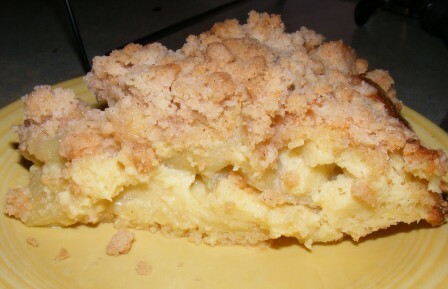 But then, I have a lot of great apple pie, tart, and cake recipes to choose from. This recipe, the last of three apple pie recipes in the Sweet Tarts & Pies section of The Modern Baker, is the only one that really seems like pie. 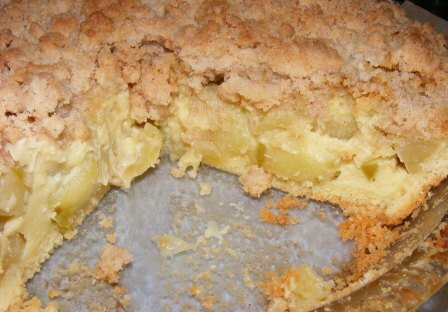 The other two — Breton apple pie and Maida’s Big Apple Pie — are more of a cake and tart, respectively. 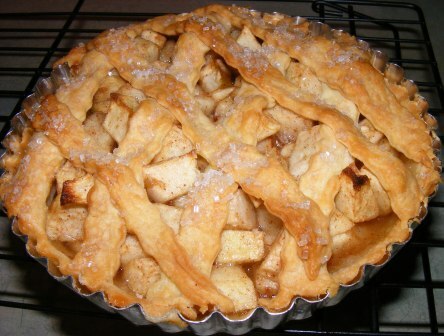 Each one is delicious in its own right, but none, including this one, reminds me of a classic apple pie. 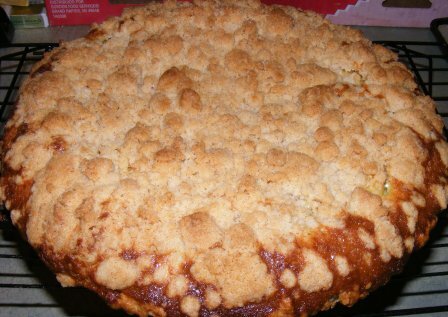 When I think of apple pie, I picture a double-crusted pie (although I don’t have anything against crumb topping, either) with a filling made of apples, sugar, cinnamon, butter, maybe a splash of lemon juice, and not much else. 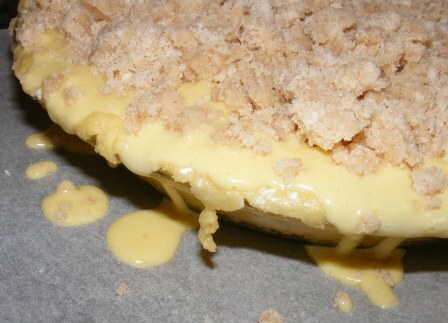 The twist in this recipe is the addition of sour cream, which makes a custard-style pie. 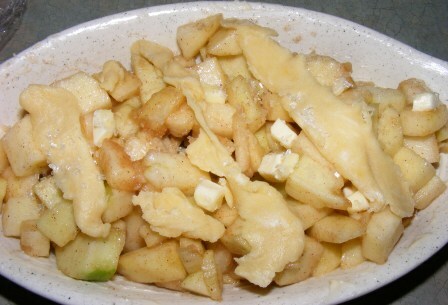 To make the pie, I began by cooking down some apples in butter and sugar. 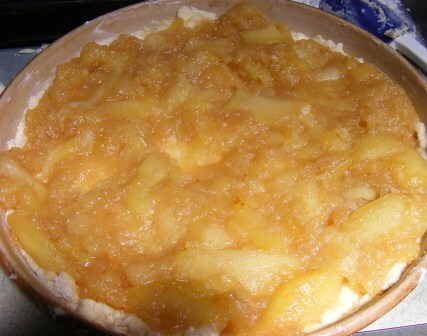 While the apples were cooking, I whisked together flour, sugar, eggs, vanilla, and sour cream. Then I made the crumb topping, which consisted of flour, sugar, baking powder, cinnamon, and butter. 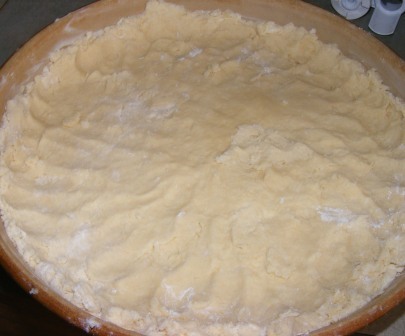 Finally, I rolled out and panned a single crust sweet pie dough. 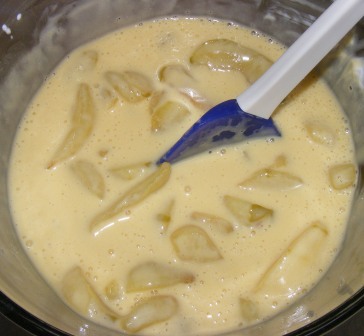 Once the apples had cooled, I combined them with the sour cream custard mixture. 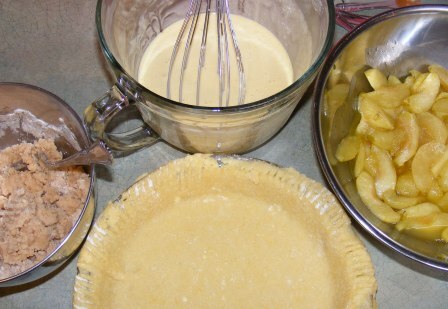 As soon as I put the filling into the pie, I knew I had a bit too much. Fortunately, I had placed the pie pan on a parchment-lined jelly roll pan, so it caught the overflow. 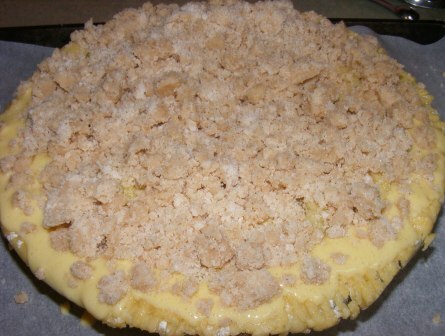 After topping the pie with the crumbs, I baked it at 350°F for about 55 minutes, until the filling was set and the topping nicely browned. I cooled the pie (more or less), then sliced and served it for a late-evening snack. 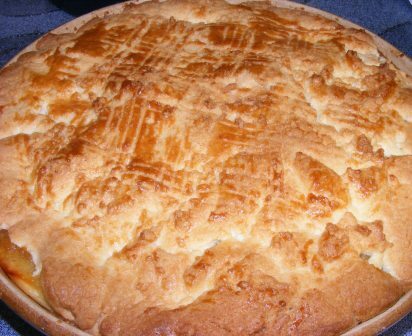 The recipe says that the pie needs no accompaniment, and it was certainly good on its own. Don’t tell Nick, but it was also awesome with ice cream and whipped cream! Those of you who regularly visit my blog know about my obsession with all things pumpkin. What you may not know is that I have a similar obsession with apples. Not just apples, but apple pie. So I was excited to find out that the Sweet Tarts & Pies section of The Modern Baker has not one, but three apple pie recipes. And that each is quite different than the others. And none of them is the usual double-crusted or crumb-topped pie that I’m accustomed to. Not that there’s anything wrong with the standard apple pie. But I thought it would be nice to have a few interesting twists on the old standby dessert to add to my repertoire. The first of the apple pie recipes is actually based on a cake — gâteau Breton, a dense French cake that’s a lot like our pound cake. 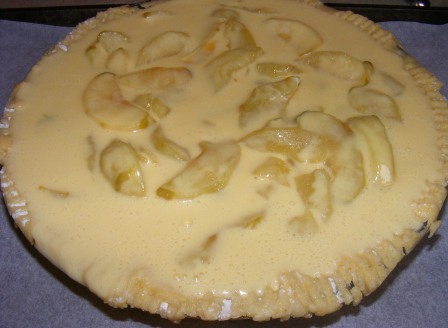 Nick’s twist on the classic Breton, as the cake is commonly known, is the addition of an apple filling, which is spread between two layers of dough. 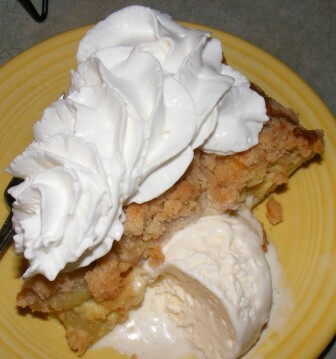 Unlike most apple pie recipes, which are made with a firm baking apple, this recipe calls for Golden Delicious apples. 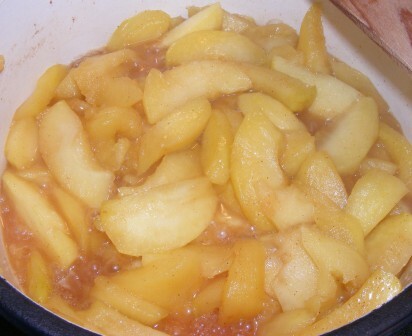 Firmer apples are generally preferred for baking, as they don’t break down when cooked like softer, sweeter apples. 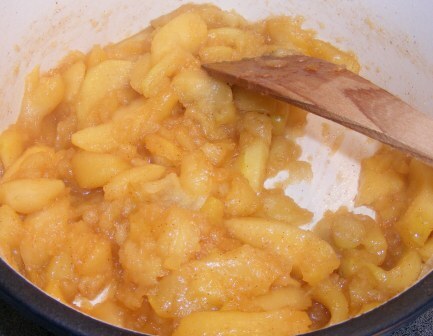 But that’s exactly what the apples are supposed to do in this recipe, so Golden Delicious are a good choice. 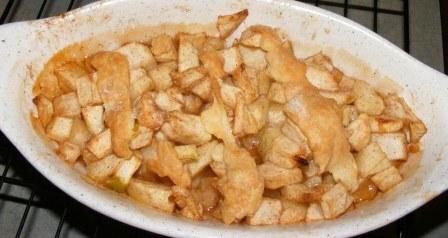 I started by peeling, coring, and slicing the apples, then putting them in an enameled Dutch oven with butter, sugar, lemon juice, and cinnamon. I cooked the apples until they gave off most of their juice, then continued cooking until the water had evaporated and the apples began to break down. The filling had the consistency of chunky applesauce. While the apples were cooling, I made the dough. After beating sugar, butter, and vanilla to incorporate air, which would make for a light dough, I beat in egg yolks, then stirred in flour. If you have ever made a pound cake, this method probably sounds familiar, as it is very similar to how pound cake batter is made. 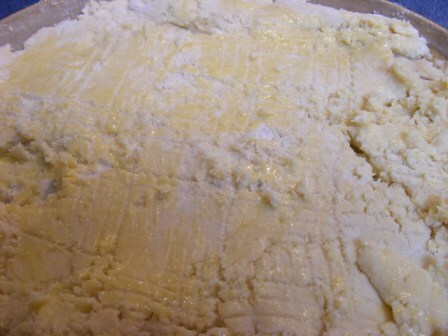 I spread about half the batter into a 10-inch stoneware pan that had been buttered and lined with parchment on the bottom, and pressed the dough partway up the sides of the pan. 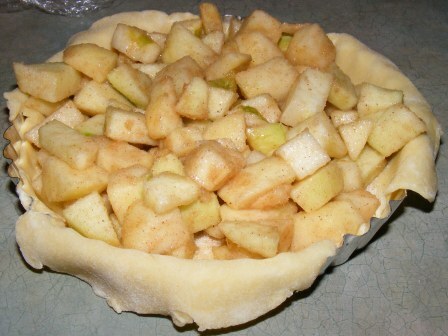 I spread the cooled apple filling over the crust, then topped it with the rest of the dough, which had been pressed into a 10-inch circle. After brushing the top crust with egg wash, I used the tines of a fork to trace a lattice pattern on the Breton. I baked the Breton for about 50 minutes in a 350° F oven, until it was baked through and the dough was golden brown. After it cooled, I turned the pie out of the pan and onto a cake platter. I served it plain, and it was fine that way, although it also would have been good with sweetened whipped cream or vanilla ice cream. I really liked the flavor and texture of this dessert, although it seemed more like a cake to me than a pie. The next time I make it, I think I’ll just call it a “Breton” and let everyone decide for themselves what that means.